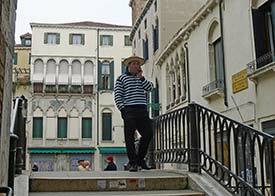 ABOVE: A gondolier on the Ponte Santa Maria Mater Domini. 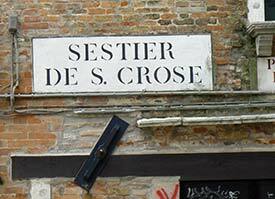 Venice is filled with visual cues that can help lost tourists find themselves, if only they know where to look. 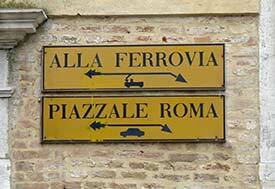 By looking around the square, you can can see a number of signs on the walls of the buildings. 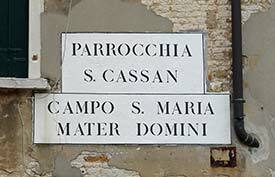 It's also worth noting that some streets in different parts of Venice have the same name, and in at least one case that we know of, two parallel streets (the two Calli delle Oche near the Campo San Giacomo dall'Orio) share a name. This can be useful to know when you're looking for a specific address. 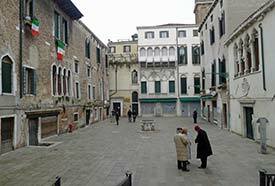 Speaking of addresses, Venetian addresses aren't consecutive street numbers, and they're almost meaningless without a directory that identifies addresses such as "San Polo 1541" by location. 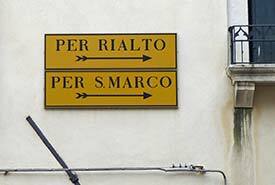 And there you have it: How to navigate around Venice in a nutshell. If you get lost, don't worry--you'll hit a major canal or the Lagoon before you go too far afield, and Venetians are generally willing to give directions, although the often-heard"sempre dritto" ("go straight") shouldn't be taken literally in a city where even direct routes have twists and turns every few meters. Our capsule advice: Carry a map (but don't rely on it too heavily), look for signs, and when in doubt, follow the crowd.